Allah Made Me Funny – Live in Concert is a groundbreaking, 90-minute concert film following three acclaimed comedians as they travel across the country using humor to share what it’s really like to be Muslim in America. Preacher Moss, an African-American Muslim and former writer for Damon Wayans, George Lopez, and other top comedians, quit selling his best ideas and now takes them on the comedy circuit to make people laugh, as well as challenge what they think they know about race and religion in America. Mohammed (“You Can Call Me Mo”) Amer, a Palestinian Muslim has toured extensively for the USO, and was recently featured at the Las Vegas Comedy Festival. He is still working his smart mouth and youthful looks to international acclaim. Azhar Usman, the “Ayatollah of Comedy” or “Bin Laughin,” is a Chicago-born Muslim who made his Indian parents proud by becoming a lawyer, but then promptly became a full-time comedian. He has toured in dozens of counties across the globe. His 2007 performance in Egypt was the first stand-up comedy show in that country’s history. By poking fun at themselves, their communities and the tricky predicament of being Muslim in post-9/11 America, Allah Made Me Funny – Live in Concert gives people of all cultural backgrounds an opportunity to laugh hard, drop their guard and open their minds. 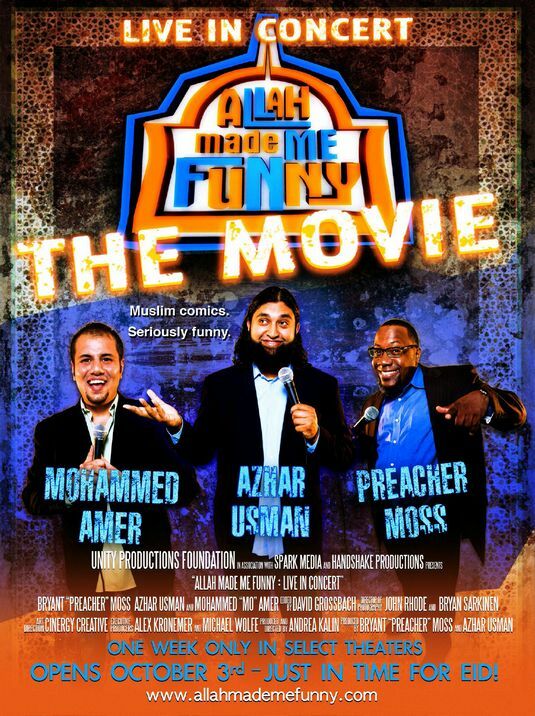 An exciting collaboration between Spark Media and Unity Productions Foundation, Allah Made Me Funny – Live in Concert was released theatrically in 17 cities in 2008, and is available on DVD. Spark Media began community outreach early by screening a nearly completed version of the film at the University of the District of Columbia for a local audience. As a special surprise, Mohammed Amer opened the screening by performing a short comedic set for the audience. Spark also helped develop the Laughing While Muslim website, which centered around a virtual town hall meeting linking audiences in Los Angeles and Washington D.C. The panelists discussed how comedy can help audiences confront the serious issues about tolerance and religion that we face in the United States today. Online audiences also joined the live meeting, submitting questions to panelists and answering polling questions that were then discussed during the event. Funded by One Nation, “Laughing While Muslim” contains clips from the “Allah Made Me Funny” film and the town hall event, as well as additional information about the panelists.